Hair Colour 2016 – What are the current Top Trends? One of the most popular ways to express yourself is with the colour of your hair and the shade that you choose to rock. Hairstyle colours and trends continue to evolve each year for exciting looks that draw plenty of attention. Although ombre and natural highlights were popular in the previous year, there are a selection of new colours that are currently a hit for 2016. Although eggplant was overdone in the ’90s, it’s officially returned as a trend in 2016 that allows women to avoid straying too far from their natural hair colour. Eggplant is moody and a bit gothic but is a refreshing look on those who have dark hair and often feel limited on their colouring options. Eggplant is also more gentle on the hair and isn’t as difficult to remove compared to bolder shades. This makes it easy to protect the hair from damage and prevent split ends. Dip-dye pink, blue, and other pastel colours have made a comeback from the ’90s and are a natural way of looking like a rocker without getting too extreme. Light pink is most ideal and stands out when used on blond or lighter locks for a gentle touch that is still plenty feminine. This offers a pop of colour in the hair at the end of the strands without looking too dramatic with how it blends in with your natural shade. More women are wanting to become redheads in the new year by dying their mane a mixture of copper red and brown bronze. This is an ideal colour on those who have a pale complexion and want to make a statement with a vibrant undertone that still looks natural. A blue-based version of ronze can also be used on those with dark complexions for an edgy look that is still plenty mysterious. Although blondes are known to have fun with the colour of their hair, more women are darkening their locks with bronde, which is a moodier shade of blonde. It’s perfect for the fall and winter seasons for a natural hair colour shade that is a refreshing twist from platinum. Bronde is also ideal for those who want to slightly alter their hair without undergoing a dramatic makeover. 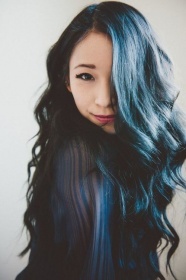 2016 invites women to have more fun with their hair, especially with blue tint hues that are plenty edgy and dramatic. The colour is perfect for brunettes or those with a darker complexion without resorting to outdated browns and chestnut shades. The colour is also perfect on those with shorter hair, which prevents it from looking too dramatic when it’s styled. This popular hair colour also nods to pinup figures from the past for a retro style that now looks plenty vogue.